So we just rolled out a new Ethiopia, and it’s got quite a name: Washed Ethiopia Sidama Yerga Alem. I’ll break it down bit by bit, and then describe how it differs from the other Ethiopias in our lineup. Ethiopia: The country where the coffee was grown. Washed: We’ll come back to this, I promise. It’s the only non-geographic part of this coffee’s name. Sidama: Sidama is a geograhic distinction that is similar to a U.S. state. There are some important differences, but for our purposes, it’s the next layer down from country. Yerga Alem: The town. Now, coffee is not grown in town, but the farmers who grew this coffee brought it to the nearest town, Yerga Alem, for collection and processing. Washing (or wet processing) is one such processing method. The fruit is removed using a mill and water soaks almost as soon as the coffee has been picked. These coffees are very common in Central America, East Africa, and another famous region of Ethiopia, Yirgacheffe. Our Ethiopia Kochere is one such coffee. Sidama, though, is known for Natural (or dry processed) coffees. The fruit, with the seed inside, is allowed to sit and dry in the sun for a longer period of time. These coffees have an intense, fruit-forward, winey character. Our Decaf is a decaffeinated Natural from Sidama. And Sidama isn’t the only place known for nautral processing. Our Natural Ethiopia Yirgacheffe Aricha is, as the name indicates, a Natural from Yirgacheffe. 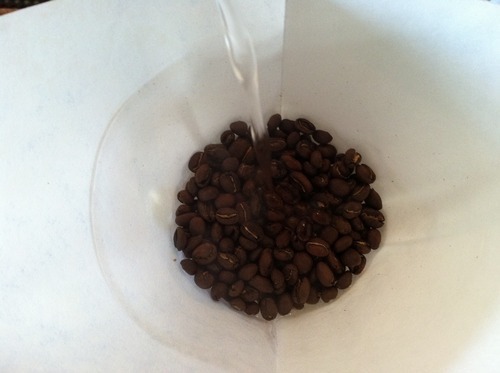 This new coffee, a Washed Sidama, is unusual, because its processing method is uncommon for its region. Knowing about geography and processing lets us highlight why this coffee is so special. So there, in a nutshell, is the name of our newest coffee, and how it is different from our other offerings from Ethiopia, coffee’s genetic home. For extra credit, taste the Ethiopia Washed Sidama Yerga Alem, and discuss with your barista how its flavor reflects its origin and/or its processing method. Our account was hacked by an April Fool yesterday. On each bag of Bow Truss coffee, you will find three carefully selected flavor notes. Other coffee companies present similar notes on their bags. Today, we are making public a long-held trade secret: these flavor notes are generated by a very peculiar coffee industry ritual, invented by Hills Brothers coffee company in San Francisco in the early 1900s: the flavor wheel. To be more precise, it is now flavor wheels — the recent explosion of specialty roasters means that the SCAA had to develop extra wheels. Here’s how it works: at the annual US Barista Champonship, the competitors, in order of their score, spin a large game show wheel. Whatever flavor note the wheel ends on belongs to that company for the coming year. No one else may use it. Baristas spin the wheel (now wheels, as there are so many competitors) to earn good tasting notes for their companies’ packaging. Bow Truss is proud to increase transparency by sharing the existence of this practice. In short: fact. Our newest hire, as his first work responsibility, was instructed to eat only raw, green coffee beans for his first month of employment. This led to significant weight loss, and we can confirm many “weird old tips” about reducing your weight: eat green coffee! We at Bow Truss love to make things more cozy. Well now, you can be cozy despite this unusually long winter. Just pick up one of our new full-body-cozy sweaters. These fashionable, innovative garments are available at our Lakeview location for only $1! 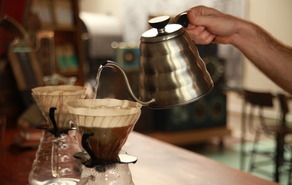 Much of the current specialty coffee industry is focused on origin. Knowing what country, region, and farm your coffee came from has been seen as an important part of roasting and serving coffee. Curious to do some of our own origin research, we got on our bikes and followed a green coffee delivery truck. We were shocked at what we found: not just one, but every coffee delivery comes from within the US (we didn’t think those trucks could get all the way to Ethiopia!). Our labels will begin to reflect these findings. Look for Minneapolis, Oakland, and New York coffee showing up on our shelves soon! We, and others in the specialty coffee industry, have long been proponents of freshly ground coffee. The more recent the grind, the thinking goes, the more flavor will make its way Ito the finished product. We’ve taken this philosophy to its logical conclusion, and are proud to be the first specialty coffee company to advocate for no-grind brewing. Just measure your coffee, put it into the filter, and be amazed: the intact coffee bean, robbed of NO volatile aromatics or gases, will brew a delicious cup of coffee! Here at Bow Truss we are always pushing specialty coffee to be more delicious, more approachable, and more cozy. We’ve been hard at work doing some serious coffee science, and now, after months of work, we’re ready to present some of our findings. Some of these new ideas fly in the face of what we’ve been taught, but rest assured, we have tested these assertions extensively. As Barista Educator, I am proud to be presenting the findings that our team has worked so hard to bring to light. Stay tuned to Bow Truss social media all day for these important announcements. Don’t forget to follow Bow Truss on twitter and instagram to see our baristas Talya Strader and Greg Albright serve coffee at Ted Active in Whistler this year! It all started when Stephanie Lock of Rustic Tart inquired about selling her pie at our Flagship store in Lakeview. It wasn’t that we didn’t find her pie absolutely delightful, it’s that we believed that something happens when an artisanal product leaves the hands of its maker. We are coffee professionals, but leave the baking at home. The next day, Stephanie came back with the idea of pop-ups. Since then, we have had different pastry vendors come in to sell their products to our customers every Saturday and Sunday in Lakeview, as well as Mon-Fri in our River North location. We have seen awesome relationships grow out of this, and have benefitted in the cross over of our vendor’s loyal fans. What is a pop-up? Essentially, it’s a store within a store. In our case, our vendors are very independent from us. They handle all of their own payment procedures, and do not pay us to be in our space. We give them coffee, they give us treats, and we sell to the same customers. This simple idea has given us the chance to meet with all different types of people and expand our market. We want to take the chance, now, to introduce you to our lovely vendors! Jillian has been passionate about baking and cooking for as long as she can remember. Growing up with an Austrian grandmother who always made everything from scratch, there were ample opportunities for Jillian to play the role of sous chef - and she did so with gusto. Jillian decided to study French in junior high school, fell in love with the language, and continued pursuing French all the way through college, spending her final semester in Paris. There, she spent every free moment roaming the enchanting streets, soaking in the culture and amazing food. Back in the U.S., Jillian embarked on a lengthy copywriting career, working at a number of ad agencies in Chicago. It wasn’t until 2010 that she decided to trade in her high heels for kitchen clogs, enrolling in The French Pastry School, and following her culinary passion. Shortly after, Très Jolie Pâtisserie was born. Working out of Kitchen Chicago, a commercially licensed shared-use kitchen, Jillian is right at home, experimenting with new recipes, ideas and flavors. Its where her creativity shines. Everything is made by hand, by Jillian. Even her croissants (her personal fave) are hand-laminated and hand-rolled - no machines involved! It’s a labor of love, but one she attends to with a smile on her face, as it brings back memories of working alongside her grandmother. 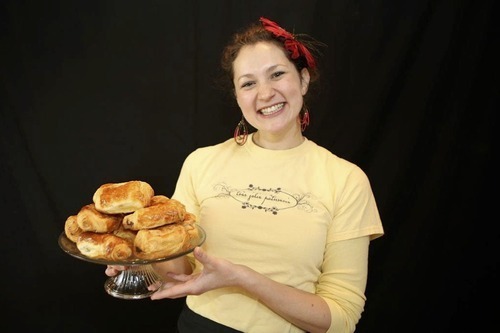 Currently, Jillian only sells her rotating menu of products through her website (tresjoliepatisserie.com), at the Nettlehorst Farmer’s Market, and when she pops up at both Bowtruss locations. Jillian loves to put together custom sweet tables and favors for clients - her products are a huge hit at weddings, birthdays, showers and corporate events. If you have a special event coming up, definitely bend her ear. Spend Valentine’s Day at our River North location! Tony overseeing a roast in progress. What do you believe good coffee should taste like? I think good cup of coffee should have a balanced and integrated profile in a way that fully represents that particular coffee. Not balanced as in, all coffees need to have equal levels of sweetness, acidity, and body, but all three should at least be present and working together to fully express everything the coffee has to offer. What’s your favorite brew method and why? Recently I’ve been using an AeroPress, its quick, simple and travels well(it’s especially nice for camping). Chemex is a close second though, because I consistently get great, well-balanced coffee out of it without a painstaking brew process. Why do you think you and Dennis will make a great team? I think we have fairly different histories and experiences with roasting and with coffee in general, and I think that that will help prevent us from only approaching coffees from single mindset, which can happen occasionally. Basically, roasting will be more of a conversation with both of us working with the coffees and roast profiles everyday. 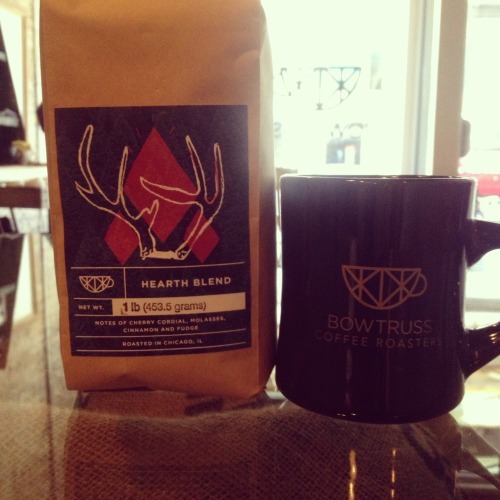 What do you hope to bring to Bow Truss as a growing roasting company? I’ve worked at a new small coffee company before and just left a larger, more established, company, and I think I have a good perspective on where we’re coming from and, generally speaking, where we want to be. I hope I can take my past experience and apply it in a way that helps keep things going as smoothly as possible as Bow Truss continues to grow and expand. What excites you most about living in Chicago? Probably the variety and quality of food, followed by the sheer amount of stuff there is to do. There was always stuff going on in Seattle for sure, but I’m excited to see what Chicago has to offer being a bigger city and all. Also I just recently found out Liverpool is supposedly going to be playing a friendly [exhibition soccer/football match] here this summer, so that would be pretty awesome too. What must-have albums do we need in our record collection at Bow Truss? My answer to this question changes pretty frequently, but right now I’d say the top 5 must-haves are: Bob Dylan: Desire, Radiohead: Kid A, Wilco: Yankee Hotel Foxtrot, Black Keys: Rubber Factory and… the last pick is always the toughest… I’ll go with Led Zeppelin: III. Don’t say hi to Tony if you see him roasting—it’s an intense process requiring lots of concentration. But if you see him around town, welcome him to Chicago! Gingersnap is one of our customer’s favorite vendors and have been asked to cater a number of our their work meetings and events. 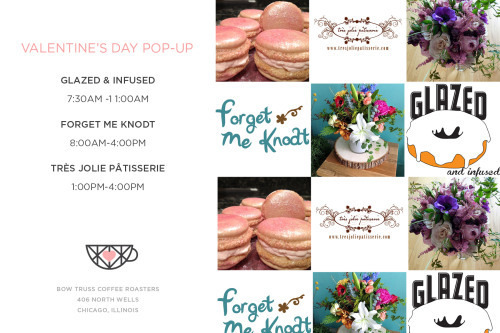 They pop-up most Wednesdays in River North and occasionally on Saturdays in Lakeview. Try their whirlaways… they’re delicious. We’re growing Bow Truss. Grow with us. We’ve grown like crazy. Opened a second location, made our coffee available at more restaurants and cafés, and brought you select and transparently-sourced single origin coffees (and a few exciting blends, too!). For us to continue on our path of expansion and innovation, we will need to increase our roasting capacity. The demands of our growing customer base at our coffeebars and our wholesale partners’ establishments, motivated the decision to expand. We’re seeking out a larger roaster to allow us to keep our coffee quality as high as possible. This machine will greatly increase our roasting capacity allowing more and more people to taste the delicious coffees we create. We want you to be involved and to be a part of our growth, as so many of you have been already. We love what we do, and we think that you will too! 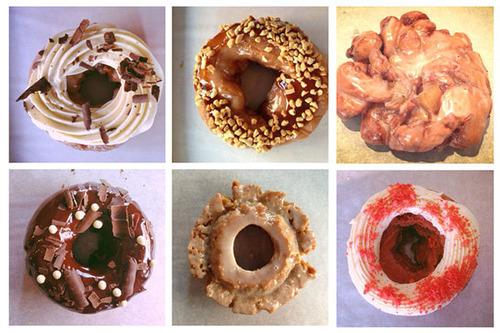 Glazed and Infused is a flavorful re-invention of the Iconic American doughnut. Handcrafted and uniquely imagined for your delight. This relationship has been so magical for both parties involved. Our customers love them, their customers love us, and the rest is just a party. Glazed & Infused has been a staple for our Friday River North pop-ups, and truly make the end of each week feel like a holiday. You know what we do for holidays, right? Eat doughnuts! 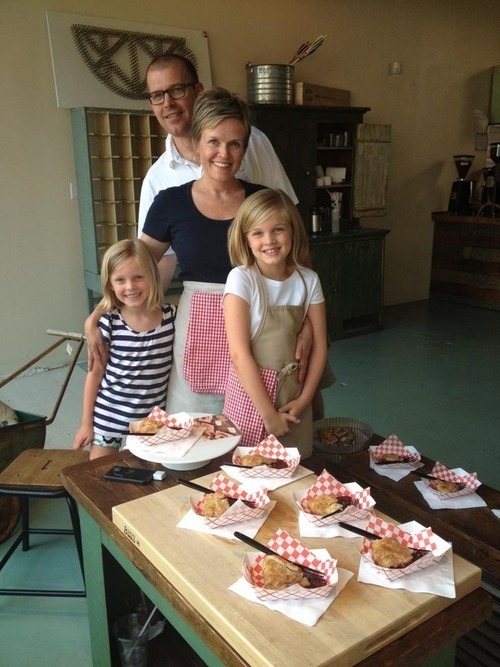 It all started when Stephanie Lock of Rustic Tart inquired about selling her pie at our Flagship store in Lakeview. It wasn’t that we didn’t find her pie absolutely delightful, it’s that we believed that something happens when an artisanal product leaves the hands of its maker. 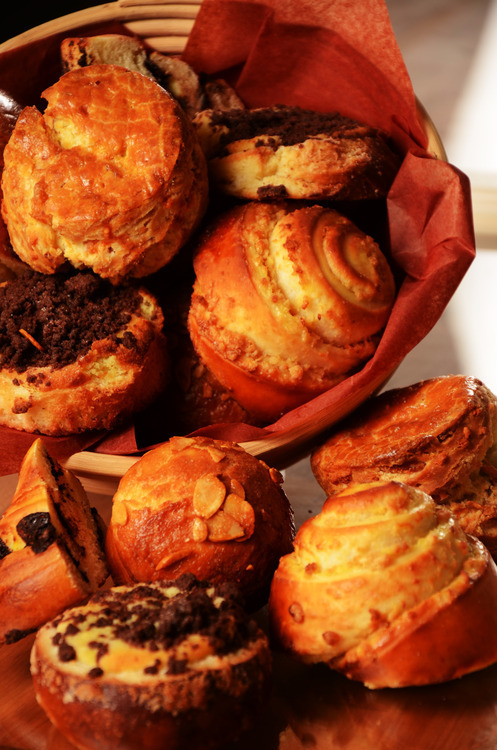 We are coffee professionals, but leave the baking at home. The next day, Stephanie came back with the idea of pop-ups. Since then, we have had different pastry vendors come in to sell their products to our customers every Saturday and Sunday in Lakeview. We have seen awesome relationships grow out of this, and have benefitted in the cross over our vendor’s loyal fans. Stephanie Lock has been creating delicious tarts, savory and sweet, for us since the July after we opened our doors to the Lakeview East community. She introduced us to the idea of pop-up shops, and we can’t be more grateful! As we opened our second location that next February, Stephanie was ready to set-up shop there, as well, and has helped us with our Annual Holiday Market. She is known by the community for her friendliness, charming family, and delicious creations. We now carry Rustic Tart daily at our Lakeview location in the form of pies and ready to roll dough. 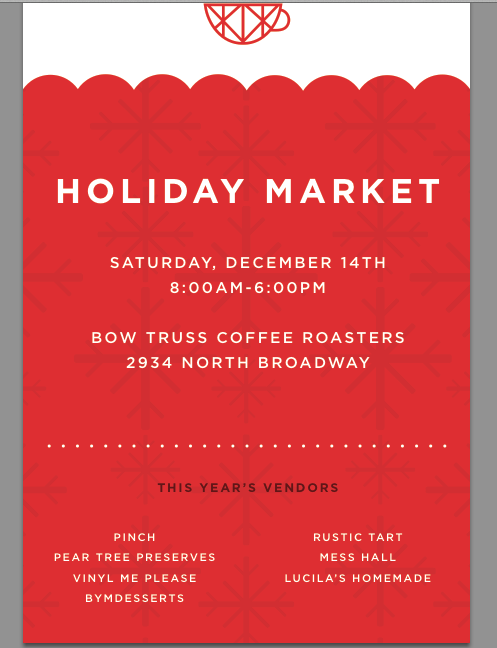 Join us for the 2nd Annual Holiday Market! Introducing the Bow Truss Barista Team! Part Seven. Here at Bow Truss, we recognize our baristas as the first point of contact for all of our customers. Without their friendly demeanor, passion for coffee, and ambitious initiation on new projects, we would not have been able to grow as quickly and with the same quality standards as we have to this point. So, we want to take a moment to introduce you to the stellar crew that work, day in and day out, at the front lines, for the love of Bow Truss Coffee Roasters! The barista we would like to recognize next is Brian Ensminger who you might know as the extremely friendly face who greets and engages you with sincere joy and friendliness. Q: How long have you worked for Bow Truss? A: Somewhere around four or five months. Q: Why did you want to start working for Bow Truss? A: I was really impressed with the way the staff balanced their knowledge coffee and kindness in service. Working as a barista, it’s easy to focus on one or the other, but at Bow Truss, I saw professionals who did both really well. 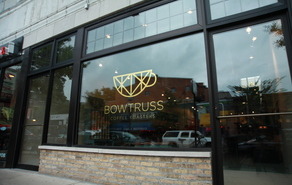 Q: What is your favorite aspect of working for Bow Truss? A: Other than the staff, I really love working with our customers. 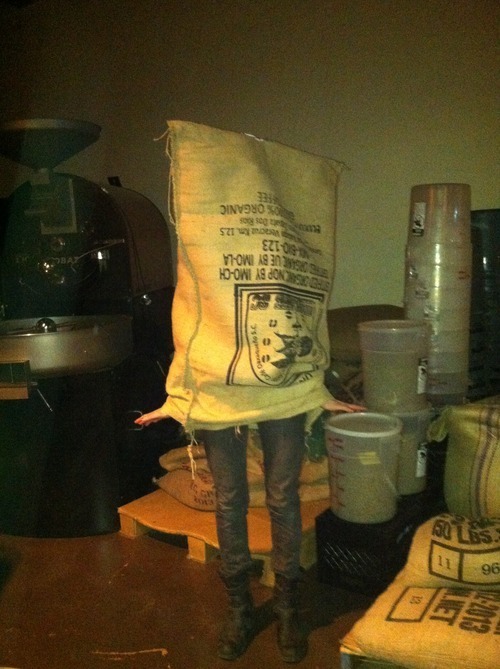 I think its amazing to have so many people who come to us that are just as excited about great coffee as our baristas. Q: What is the most valuable lesson, coffee related or not, that you have learned while working for Bow Truss? A: Whether it’s dialing in espresso, or shifting between confidence and humility, I think the most valuable lesson I’m continuing to learn is balance. I’m learning that balance is something that you have to focus on and work to understand, but it’s definitely not a mystery, nor impossible. Also, balance will look like different things to different people and that can be frustrating, exciting, and wonderful all at once. Q: What do you do outside of working at Bow Truss? A: Mostly drink coffee, spend time with my lovely girlfriend Molly, drink beers, watch movies, read stuff on the internet. A: I enjoy nerding out about movies and television over drinks. Really nerding out about anything: coffee, books, music. Any chance I get to learn, and act like a know-it-all, I’m all about. Q: Who is your role model and why? A: Honestly, I have a few. I look to different people for different things, and I’m lucky to have a lot of awesome people around me (both at work and in my personal life) who provide fantastic examples of how to be great people. Q: Tell me a strange fact about yourself! A: Despite knowing it’s totally wrong, I pronounce the word “pillow” as “pell-oh.” I have no idea why. While Bow Truss and Brian have been friends for a while, he just recently joined our team recently. You know him for his big smile, memory of your drink, and willingness to talk with you all day. 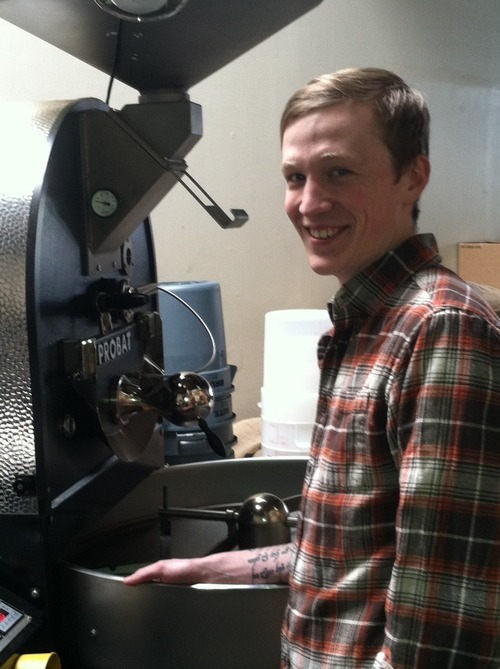 We appreciate his dedication to quality coffee, quality service, and desire to make himself better each day. Introducing the Bow Truss Barista Team! Part Six. 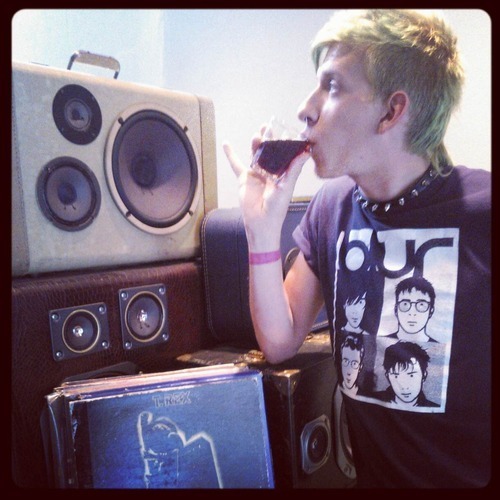 The barista we would like to recognize next is Jason DeLong who you might recognize as the dude with the bright hair that is constantly changing colors. A: I really wanted to learn about coffee in a well rounded way. A: I learned there definitely is such a thing as too much caffeine. A: Drawing and other various forms of expression. A: Kurt Cobain because he did what he wanted to. Q: Tell me a strange fact about yourself. A: I like saying business signs out loud as I see them. 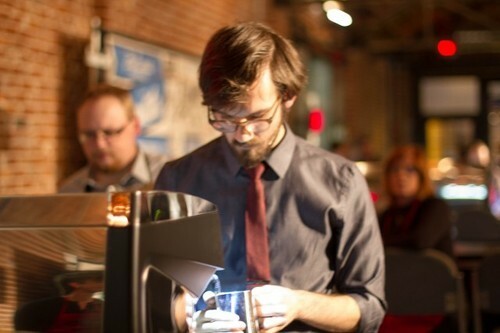 Jason was referred to us by a dear coffee friend who said, “You’ve got to hire this guy. He has such a positive attitude! I wish that I could hire him.” You know him for his up beat greetings, courageous style, and his willingness to talk to you all day. We appreciate his unbeatable cheer, how great he works with a team, and his desire to continue learning. Today! Come grab your 1st of many pounds of Hearth Blend!